Gopal’s Fun School (GFS) is a weekend program for urban kids. Every parent has an earnest desire to give their child the best by fulfilling their physical, emotional, social and spiritual needs. GFS recognizes the importance of these priorities and equips children with life long skills, which will enable them to make positive and outstanding contributions in all aspects of life as well as meaningful contributions to society. Through a lively blend of art, stories, quiz’s, dramas, games, puppet shows and multimedia exploits a child is exposed to spiritual culture and wisdom. The sessions include spiritual prayers, meditation and yoga. GFS imparts holistic education to children in the development of their character and personality. Workshops encourage the development of basic values and talents. A simple gesture of offering flowers to the altar cultivates the value of giving and not withholding. It evolves in to a spirit of compassion and sharing, and a selfless concern for others. Modern society has discovered that, beyond physical needs, human beings also have emotional and spiritual needs. Parents today are baffled and pained to see their children succumb to stress, depression, addiction, violence, delinquent behaviour and even suicide. Moreover, they often have little respect for their parents and elders, and do not abide by traditional moral and spiritual values as meanings have been diluted over the years. Studies confirm that a child bereft of spiritual training easily falls prey to bad habits. A spiritually guided child, on the other hand, is well equipped to counter harmful influences and confidently face the stresses and tensions of modern life. Knowing why things are done is also beneficial to the child and enables them to transfer their inquisitive and knowledgeable nature to all aspects of their life’s. 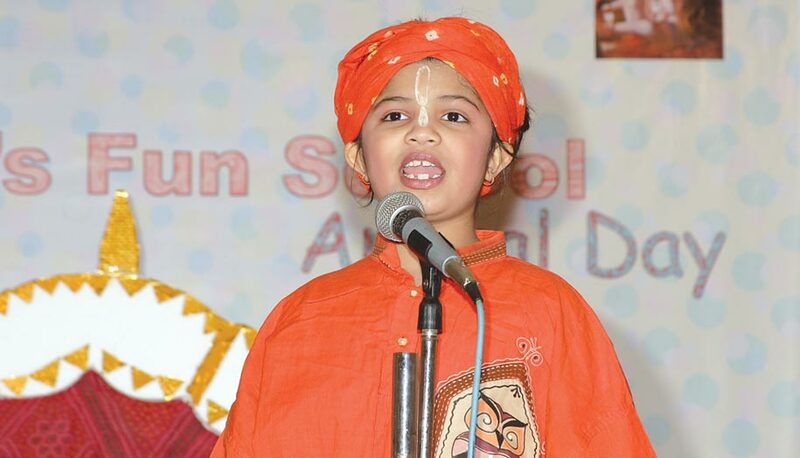 The concept of the fun school at ISKCON Chowpatty is about 8 years strong. As part of this program, children of various age groups are trained expertly in the spiritual field with a view to awaken God consciousness in them so that over a period of time they become divine law abiding citizens and consciously make the correct decisions in life to keep away from everything any caring parent would want them to avoid. As part of the program, students are taught various aspects of the Bhagavat Gita , outdoor games based on Krishna Consciousness, kirtans/instruments and bhajans/traditional Indian folk music. Above all they are provided with a sense of responsibility towards themselves and society as a whole. With an enrolment of around 350 children between age groups of 3-5, 6-8 ,10-15 ,15-21, the school continues to grow with many parents articulating their satisfaction and appreciate of the institution and the positive impact it has had on their children. There are currently 2 schools in Thane and couple of them in South Mumbai. Will these studies not burden my child ? GFS adopts sate-of-the art techniques to make learning a joy. Teaching is done through a lively blend of art, craft and drawing, quizzes, assignments, worksheets, dramas and puppet shows, spiritual games and picnics and colour slide/ video shows. Bal-utsav (Festivals for children) provides the children an opportunity to display their talents. Why does my child needs GFS? Modern society has started discovering that human beings have not just physical needs, but also emotional and spiritual needs. In the Western countries parents have provided abundantly for the material needs of their children. Yet despite their best efforts, most parents are baffled and pained to see their children succumb to stress, depression, addiction, violence, delinquent behavior and even suicide. Even if the children survive such unfortunate influences, when they grow up, often they have little respect for their parents and elders and then they disregard ethical, moral and spiritual values that their parents cherish. Numerous surveys have confirmed that a child without a spiritual basis to his life easily falls prey to bad habits. A spiritually trained and guided child on the other hand, is well equipped to counter harmful influences and confidently manage the stress and tensions of modern life. Therefore, GFS aims to help responsible parents in raising their children by offering systematic and scientific training in spiritual culture and wisdom.